I have homemade chocolate chip cookies in the oven right now. I should be in bed. Or, at least this morning I told myself I would be in bed by this time tonight, but suddenly I got home from work and I wanted to do ALL THE THINGS like make crafts for R's birthday party and bake cookies. I tried to talk myself out of them (the cookies) and it worked for about an hour and a half. Over the weekend I found this pin on Pinterest and found a giant R at Hobby Lobby and thought, Sure I'll just glue some pink tissue paper on this R real quick. Two days later and it's still not finished, thanks for asking. Her decorations might consist of one half-finished R and wilted balloons left over from my birthday. I keep reminding myself that R's favorite toy is the top of shoe box, so she probably won't care how many balloons she has at her party. I don't have a party theme. Basically what I did was walk around Hobby Lobby and grab things I thought were cute. Everything was pink and gold, and when I got home and started looking at Pinterest I realized that pink + gold is an actual party theme, so there you go. Speaking of, what are your thoughts on seeing something you like on Easy and trying to make it yourself? Part of me feels bad for blatantly copying someone else's work and not shopping small, supporting the little people, etc. The other part of me is cheap, and that's usually the part of me that wins these types of debates. I've gotten a few questions since I shared my Chicago travel video about how I put those together, so I've decided to write a post briefly explaining my process. I basically know nothing, so if I can do it, you can do it. But I think videos capture some things a photo can't and they are fun! This is my new favorite picture of R ever. 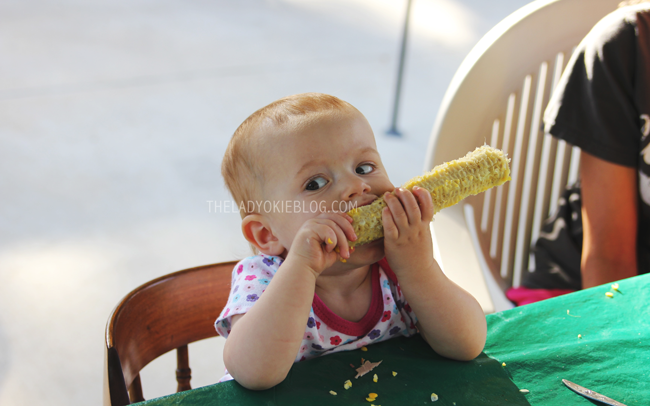 We were at my grandparents' last weekend, and she was DYING to get the corn cobs. I don't know what the deal was. She stole mine when I wasn't looking and then proceeded to bite off all the stray pieces while side-eying anyone who got close enough to be a threat. Ain't nobody gonna steal my cob! It was funny and terrifying because lord help me she is going to be a toddler soon and how will I contain her???? She is the firstborn of two firstborns. Help. My phone keeps telling me I am out of memory, but I cannot CANNOT delete the pictures from the hospital the day R was born. I keep scrolling back and looking at them and it is just crazy that it's almost been a whole year. I still shudder when I think about labor. Can I have more babies but just have the stork bring them? I really might spring for an epidural next time because ouch. And... the timer is going off. Cookies are done! I don't see any sign of willpower, so I guess it's a good thing I went running this morning. Don't try to convince me it doesn't balance out. Her favorite toy is a shoe box, I'm dying. The good news is that you are really smart and the "R" is not a "1" so at least you will be able to use it for more than one day like the poor sucker from the Pinterest pin. HOORAY for video tutorials and HOORAY for epidurals. Amen. What is it with kids and boxes? I mean why on earth do we buy them toys... just buy boxes and they're happy! I actually quite like the "R" as it is. How about you just paint the bottom half rather than tissue paper the whole lot? Get yourself an external hard drive and keep copies of your lovely photos. That's what I do. I've also seen suggestions for Dropbox as well. Haha! I'm pretty sure R won't remember her birthday party anyway! There is too much pressure on mamas these days to host a Pinterest worthy party. Love her well and have a nice time with family and that's all that really matters. So true! I'm really not that concerned about it, but I do like being crafty and pinned a couple of relatively easy, cute ideas :) I'm definitely not going overboard with tons of stuff. We only invited family so it is going to be low key! Cookies!! Ugh, now I want cookies and completely blaming you. I think your party will turn out beautifully - don't put too much pressure on yourself. My kid ended up passing out about an hour into his party, soooo :) I also have severe anxiety about deleting our hospital pictures, so I'm right there with you. I copy things all the time if it's just for personal gain! I think it's only shady if you make money off of it. But I, too, am cheap, so there's that. And if you find out how to have more babies without the whole labor ordeal, let me know please. That would just be fantastic. I STILL love scrolling through my kids old pictures, when they were born, terrible two's, school, etc. (and they are now all adults!) The moment you are preggers again you will forget the labor of the one before. Okay, not forget, but it will not mean anything. Each one was so different for me anyways, all were terribly wonderful. I had 3. Enjoy 'copying', it never is quite the same anyways, as I have discovered with the many things I have tried to copy. Enjoy it all, it all goes by so fast. I am awful at Pinterest projects. I have so many that I want to do in the next few months for the nursery and I just know half of them I will just pay too much on Etsy for. I am sure your party will turn out just fine!!! Kids love the weirdest non toy things, right?? I am terrified of labor and anytime I think about it I wonder why I got myself in to this but there is no turning back now, right? haha! Honestly when I saw the picture of the R I thought it was done and meant to be partially covered! So you could have fooled me! Pink and gold is definitely a theme, its actually the theme of my office so there you go! Enjoy your cookies! I would 100% have another baby if labor wasn't in the cards. OR pregnancy. Except maybe that 2 weeks of pregnancy where I wasn't throwing up and the crippling sciatica hadn't hit yet. girl, i think our world - especially pinterest - makes it appear that birthday parties should be amazing and it should look a certain way which is in fact not true! I think the R looks good - even if it's only half finished! also - when it comes to pictures - download the snapfish app you can upload all your pics to the website and keep them there!!! that's what i've been doing! Parties!! Nope, I don't think she'll have strong opinions on the number of balloons. It's okay, the strong opinions about birthday parties will come later. She's serious about that corn. Hooray for chocolate chip cookies! That R looks super cute and I'm sure it will look great when it is all done. Pink and gold are super cute together! I am inspired by (cough, cough: COPY) ideas from Etsy and Pinterest all the time. Should I admit that on the Internet? Crap, it's too late. I am so with you on finding inspiration on Pinterest and then copying it. Absolutely. Every party I've thrown has been like that. ;) The R is super cute so far! And I like the color scheme you picked. :) Hope you enjoyed those chocolate chip cookies! Mmm, I hope the cookies were so tasty. I've been slowly but surely chipping away at the frozen cookie dough I purchased as part of a fundraiser that is housed in my freezer. Dangerous. So dangerous. Pink and gold is a perfect party theme! mmmm cookies. that picture of R with the corn is the absolute best picture ever. i am not crafty at all, so i don't make things i see on etsy, but i am cheap, and i don't buy them, so i don't support those people either haha. love the pink & gold!